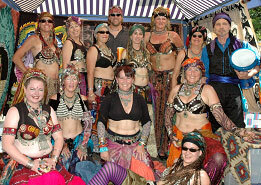 we are Julian’s own Tribal Style Belly Dance troupe. We began in the fall of 2005 under the direction of troupe leader Beryl Warnes. Plein Air Art Festival at the Santa Ysabel Art Galley in May of 2006. From that day forward we have not looked back, and we enjoy performing as much now as we did when we first started. We have performed annually at the Santa Ysabel Art Festival, the Menghini Art and Music Festival, the Fourth of July Parade, The Julian Cowboy Dance, as well as monthly performances at The Red Barn in Wynola for the past five years. In 2007 we began performing off the mountain at local San Diego Festivals, including Earth Day Celebrations inBalboaPark, the Del Mar Fair, the San Diego Area Middle Eastern Dance Association, the Bedouin Bazaar, and the Celebrate Dance Festival also held inBalboaPark. Last May we had the opportunity to perform at an International Tribal Belly Dance Festival held inSebastapolCA, and in August we made our second appearance at Tribal Rendezvous in Idyllwild. We have also performed for several fund raisers including, The Intermountain Fire Dept. Fund Raiser, The Museum of Man, a Cancer Benefit in Ramona, and for Brandeis University. The style of dance we perform is called American Tribal Style, and put simply; ATS is a uniquely American style of belly dance. Started in the late 1980s inSan Franciscoit is an eclectic mixture of Middle Eastern, Indian, and Asian belly and folkloric dances. Add some Spanish flamenco and a modern dance sensibility and you have ATS. What truly makes ATS unique is that it is not choreographed. It is a style of dance called Lead Follow: it is always done in a group of two or more and whichever dancer is stage left he or she is the leader. All other dancers follow the leader. When the leader gives the cue for a movement change (which can be as subtle as the turn of the head or the raise of a hand) the whole troupe knows they are transitioning to a new move. This organic style of dance makes for something truly creative and always exciting as we dance in the moment with each other.